Established by Greek immigrants in the 1880's, historic Greektown continues to beat as the heart of downtown Detroit as a thriving entertainment center. The district is one of the last surviving Victorian-era commercial streetscapes in downtown Detroit. During the 1960s, Greektown was reduced to one block after surrounding buildings were razed to provide sites for downtown parking and institutional buildings. Realizing that Greektown was in danger, the city's Greek community banded together to hold the first Greek festival in 1965. Business owners realized the area's rich Greek culture, made their restaurants and shops significant. Today, many tourists and residents of Detroit flock to this downtown area to eat and shop in the traditional center of the city's Greek community. 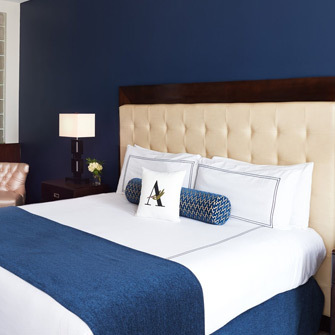 Located in the heart of Greektown, the Atheneum Suite Hotel offers an intoxicating blend of atmospheres from distinct regions of the world. Paintings of Greek mythological figures welcome you as they gaze down on the striking marble lobby, the sights and pulse of Detroit beckon just outside the front door. 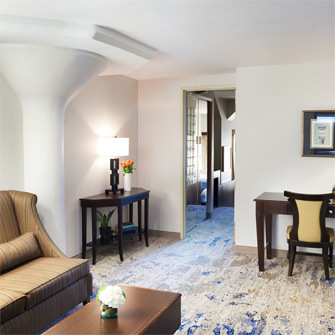 Each well-appointed suite features traditional décor with Modern Greek flair, fantastic city views and our signature oversized marble bathrooms with deep soaking tubs or whirlpools.